Pre-configured modules in 14 different Heights, custom door sizes also available. Please call 512-451-6269 for custom configurations. 8 different architectural color options, all in a durable, pebble powder coat finish. Thick, reinforced collection door to prevent break-ins. Master front-loading door has interlocking, overlapping seams to prevent prying. Integrated outgoing mail collection compartment. Tenant locks with 3 keys and hardy stainless steel latching hook cam on every tenant door with EXCLUSIVE double latching cam on all oversized doors. EXCLUSIVE double-latching parcel locking mechanism design for added door security and strength. 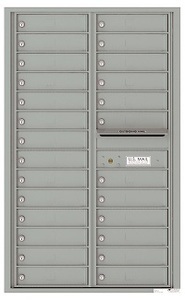 Florence Versatile model number 4C14D-26 consists of 26 tenant compartments, and outgoing mailbox. Does not meet USPS height requirements, for private distribution only.